We are Oak Springs. We provide residential, dementia and respite care for older people in our brand new, purpose-built care home. We take pride in delivering the highest quality care with compassion, dignity and respect for our residents. Prior to August 2018, we were known as Royal Oak. Whilst everything else in our home has remained exactly the same, we felt it was necessary to change our name to better reflect who we are and our philosophy of care. We are Oak Springs. We provide residential, dementia and respite care for older people in our brand new, purpose-built care home. We take pride in delivering the highest quality care with compassion, dignity and respect for our residents. Prior to August 2018, we were known as Royal Oak. Whilst everything else in our home has remained exactly the same, we felt it was necessary to change our name to better reflect who we are and our philosophy of care. Our approach to care is embedded in everything we do. We believe that our residents do not live in our workspace – we work in their home. This means our approach to care is centred around compassion, dignity and respect. We ensure that these qualities are found in every member of our team, alongside a passion for enriching the lives of the people in our care. We are focused on the individual and believe that we are all entitled to have a real and meaningful say in how we are cared for. At Oak Springs you will find an exceptional team of care staff, each of whom embody and exemplify our philosophy of care. Each of our carers either has a healthcare diploma, or is working towards one, and every member of staff receives continual development and training opportunities in a number of subjects including manual handling, dignity and care and infection control. Every resident living at Oak Springs is assigned a key worker, who is their first port of call for any questions or issues that may arise. When we welcome a new resident to our home, they will have time to get to know their key worker and agree of special provisions that will make their new home more comforting for them. At Oak Springs you will find an exceptional team of care staff, each of whom embody and exemplify our philosophy of care. Each of our carers either has a healthcare diploma, or is working towards one, and every member of staff receives continual development and training opportunities in a number of subjects including manual handling, dignity and care and infection control. Every resident living at Oak Springs is assigned a key worker, who is their first port of call for any questions or issues that may arise. When we welcome a new resident to our home, they will have time to get to know their key worker and agree of special provisions that will make their new home more comforting for them. At Oak Springs, providing the highest quality care that is safe, effective, caring, responsive and well-led is something that is incredibly important to us, which is why we take our inspections from the Care Quality Commission (CQC) very seriously. We are delighted to say that, following an inspection in October 2018, we have a CQC rating of ‘Good’, which reflects the excellent level of care we provide, the passion and commitment of our team, and the quality of management at Oak Springs. If you could like to learn more about our rating, please visit the CQC’s dedicated web page for Oak Springs, where you can read a detailed report of the inspection. You can also read our summary of the inspection by visiting our Life at Oak Springs blog. 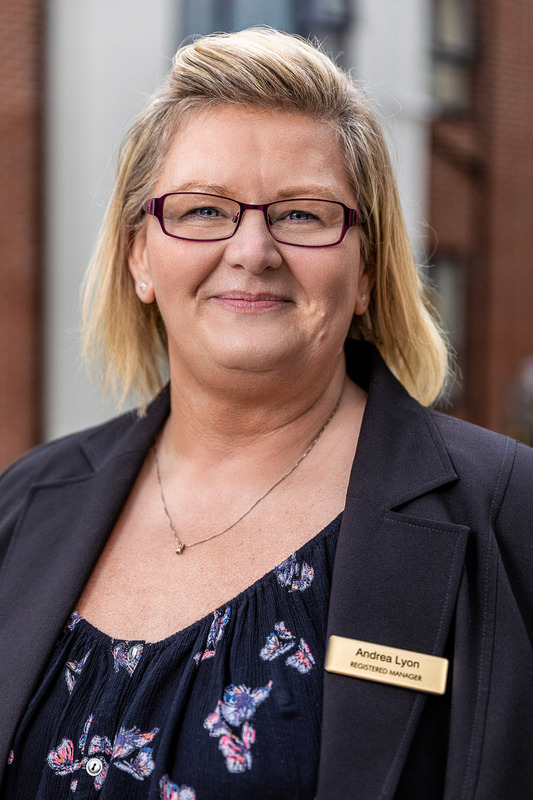 With over 30 years’ experience of nursing and care, Oak Springs’ registered manager Andrea Lyon has a well-practiced approach to providing care with kindness, compassion and dignity. Over her career she has worked in the NHS in a number of roles including acute medical wards, hospital night teams, discharge teams and as an A&E manager supporting junior doctors. She transitioned to residential care, where she has worked in various homes as a care manager, deputy manager, and now manager. Her qualifications range from a Level 5 Certificate in management for health and social care to various Diplomas in dementia and care for older people, as well as awards in medication management, end of life care and residential care. In her spare time, Andrea enjoys spending time with family, including her three grandchildren and her dog Teddy, who will soon be trained to deliver pet therapy to those living in Oak Springs. Thank you for taking the time to explore Oak Springs and learn more about the excellent care we offer in our home. At Oak Springs, our philosophy of care is instilled into everything we say and everything we do for our residents. My stance of care for older people is clear. We make sure that the care we deliver is of the quality that we would wish for ourselves and our loved ones. I’ve had an interested and fulfilling career in nursing and care. I was taught the ‘old fashioned way’, where we were at the behest of hospital matrons, who would rigorously inspect our work and demand precision, quality and respect from us at all times. The way we care has changed since then, but I’ve always carried these lessons with me. I believe that person-centred care is the best kind of care, which cannot be taught in a classroom, but can be built upon through years of experience. It has to come from deep within your heart, and I make sure that every member of the team of Oak Springs has that ‘spark’ that will make them an excellent carer. I have an open-door policy with my team, those living in Oak Springs and their families and loved ones. So, if you’d like to learn more about life at Oak Springs, please feel free to drop in for a chat. My door is always open. Amanda’s role as deputy manager at Oak Springs perfectly complements her 11 years’ experience of nursing and care. 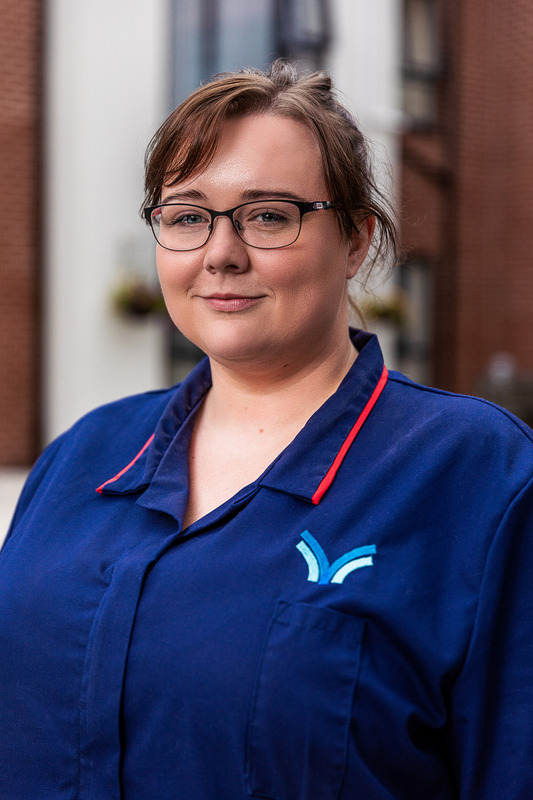 Starting as a health care assistant, Amanda has demonstrated considerable passion and hard work, which has seen her progress to senior and managerial roles in a short space of time. As well as deputising for our manager, Andrea, Amanda ensures that our philosophy of care is instilled across Oak Springs and works with members of the care team to deliver this. She has a number of qualifications and Diplomas in health and social care, dementia care, infection prevention and much, much more. In her spare time Amanda enjoys socialising with friends, taking long walks in country parks, visiting the theatre and travelling when she can. In her spare time Amanda enjoys socialising with friends, taking long walks in country parts, visiting the theatre and travelling when she can.